I am so thankful for all that 2012 brought us. I got my masters degree, was blessed with the most beautiful little boy and celebrated two years with my husband and best friend. 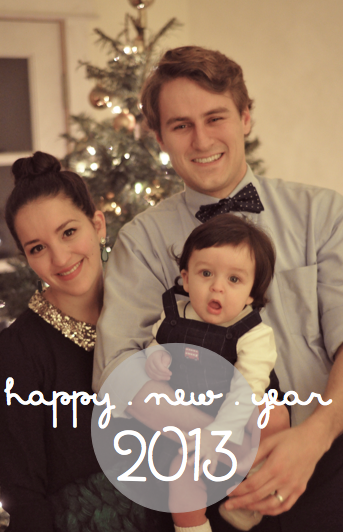 2012 you were good to us and we are so excited to usher in a new year filled with more adventures and positive energy. Sewing - Every other day I get that spark running through my veins, the feeling of creating something, an awesome feeling. But life gets so busy, messy, hectic and full of dishes, errands and dirty diapers. I want to make an effort this year to sit down at my sewing machine and create. I want to get through my collection of fabrics to turn them into beautiful clothes to add to my wardrobe. But first of all I want to complete all unfinished projects. I have about 3 dresses I started and have not completed, a couple are basically done and one needs some extra love. Cooking - I want to try to completely cut down eating out. Before having baby I was all about making interesting and tasty dinners. I want to bring that back. But I also want to challenge myself with new recipes. I was thinking to start some sort of Pinterest challenge. I think we all know that we pin the heck out of some amazing recipes, but then they disappear into the vast world of our food boards. I want to go through my food board and try those recipes. Laundry - I love doing laundry, but absolutely hate folding it. This year I want to try extra hard to fold and put away laundry right away. Some days I get it all put away and then I slack and have to start all over again, the pile starts to get bigger and eventually I have a productive day and do it all at once. I want to pace myself and do it all right away to avoid the pile up. Walks - Last summer I walked almost every single day. I had baby weight to loose, a little dude that slept in his stroller, absolutely gorgeous weather, and new mom angst to walk away. It proved to be one of the best things I've done. I saw results in huge ways mentally and physically. I did expect that to slow down with the cold weather, and I have tried to get out on some nice days. I want to make more of an effort to walk more through these next few winter months. Fashion - I've gotten this resolution off to a pretty good start. I want to always make an effort to look my best. And while I've never had any trouble over dressing, I want to venture beyond what I am comfortable with. I want to try new styles and be more confident when wearing those pieces. As I mentioned I already started with this resolution. I wore a fancy 1980's dress out for NYE despite knowing I would be overdressed for the crowd I was celebrating with. I had a momentary feeling of insecurity and a desire to change, but I took that little b*tch and kicked her out of my head, got my fur stole on and went out. Socializing - Sometimes I get into my world and never want to leave it. I want to make an effort to get out and meet some new faces.